Help with Pricing a Gomes Prototype? Discussion in 'Disney Pin Discussion' started by imp, Mar 21, 2018. I've noticed that Gomes prototypes usually list for higher prices on that auction site, but I can't find enough completed sales to get a good idea of the value of a prototype relative to the eventual pin. ...so I'm looking for some advice: if #35418 is worth $350, what is prototype #50144 worth? Here's my thoughts fwiw: You are correct that prototypes are few in number, about 4-6. Often a prototype will look the same as the final pin. In those cases, I believe they tend not to get too much of a premium (although I personally think they should) due to many people viewing them as no different than the regular pin, just having a stamp on the back. Also the number of folks that collect PP/AP is pretty small so the demand is not there to drive prices up. They do tend to do a little better than AP which have the same challenges, but probably a 10% premium or so. However, in cases where the prototype pin is actually different from the final pin, as in your case, it can be viewed as a different pin worthy of a bigger premium. The challenge is that these cases are fairly rare so it's a small market so, as you are finding, it's hard to get a good number of examples to correlate to. It starts coming down to a guessing game and what a person is willing to pay. But off hand I would say a 30% premium would be reasonable. So maybe in the $450-500 range? I would start at a higher price, 2x the value of the regular Gomes and work from there. My pin does not, by the way, have any stamp on the back to indicate that it's a prototype. I'm identifying it as the prototype based on the size of the pin and the colour of the metal. The Pinpics description does not mention a special stamp on the back - does anyone know if a Gomes prototype should have a special stamp (as opposed to AP/PP)? You can ask for a 40-50% premium for whatever the original is worth if it's an alternate metal color (especially since Gomes pins are especially coveted from the DA run). Add a 25-30% premium if it's the same metal color. You may not get it - as noted, there are few of us who collect DA AP's and protos but we are passionate about them - so if you find the right collector, they will pay a premium for a special piece. But if the original is in the $350 value range, then $450ish for the proto would not be unexpected as an end price and potentially a little higher. Note: this is only for DA pins. Park APs/PPs are considerably lower value, only about 10-15% higher value than the original version. It sounds like you know your DA prototypes - should it have a special stamp on the back? Lol yeah, they're a particular favorite part of my collection. Assuming there aren't multiples of these floating around on ebay (or have not been in the past - there are faked DA pins out there sadly), I wouldn't worry about a missing stamp, especially if it's a different color than the release metal. As I recall, it tended to be the DisneyShopping AP's that were stamped more often than the DA ones. ETA: I'll note that when I buy DA/DS protos/APs, I'm happiest if they come with their COA's or are from the original buyer directly from Disney, but if it's a pin I really like, I occasionally take a leap of faith without it. I've only been burned on a fake proto once as I grabbed the first of what turned out to be hundreds of fakes of a DisneyShopping.com pin. The actual production run of this set is unusual because not all pins in the set have the same color finish. This is documented in the PinPics listing http://pinpics.com/pinMT.php?pin=34700&keyw=gomes+nightmare . Most DA LE 100 sets used the same color finish for all pins in the set, mostly all gold, but sometimes all black or all silver. I was the one who added all five of the 2-inch NBC pins to PinPics back in the Summer of 2006. My memory of the info in the eBay listing is this. . . The first time the actual production run was created, there was a communication error at the factory and they made the pins 2 inches in diameter. And by this I mean they had created 100 sets of 2 inch pins, plus the 5 3-pin AP sets of the pins, all 2 inches in diameter. (2) Disney decided to sell the" wrong size" pins to their cast members instead of destroying them as they had done in the past. 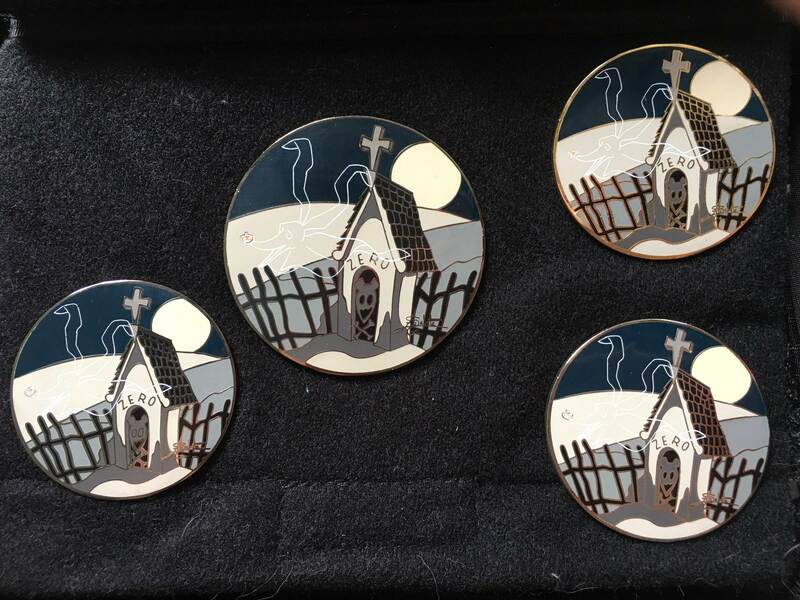 And then Disney remade the entire edition of 2.5 inch pins, which they then auctioned them off to the general public via Disney Auctions' eBay account. The 2-inch pins surfaced on eBay during the summer of 2006, two years after Disney had released the actual production run 2.5-inch pins. The first week the entire set of actual production run was auctioned off in a single listing by one of the two sellers who I had purchased the majority of my DA pins from since late October of 2005. I won that auction. The very next week the same seller listed the 5 3-pin AP sets, each set in an individual listing. I also won each of those auctions. The next week the seller listed another production run set but listed the pins individually. Auctioning the pins individually got her upwards of 50% more money then she had gotten for the complete set two weeks earlier. Then for many more weeks in succession, she listed another production run set, continuing to list each of the pins individually. The greater Southern California pin community was really buzzing about these pins back at the time they were being listed for NBC is, or at least was back then, really big in Southern California. I posted something similar to the above on Dizpins back during that same timeframe. ^ Trusts the expert. But with that said, if there are that many of these floating around, it would drop the value from what I posted. This would explain how I ended up with one that has no special stamp and no COA, although it does have the original DA card & foam sleeve. Assuming what I have is one of these 'error' pins, do you have any thoughts on what it's worth? I value pins more on their current availability (for acquisition by another) than on what folks choose to pay for them on the secondary market. Based on the above, I believe you have is a very-HTF pin. I firmly believe if there is only one available, it’s “value” is whatever the person who is willing to part with it says it is. Now, I stopped purchasing pins on eBay back when eBay started masking bidder IDs, which may have been around 10 years ago. And I have never sold anything whatsoever on eBay. I mention this because my search skills are probably not very good. But I have just tried searching open and completed listings, and I did not find any evidence that anyone is currently selling one of these, nor that they have either attempted to sell or actually sold one recently. The above reinforces my opinion that what you have a very-HTF pin. From my point of view, the fact that there are likely 100 of these in existence doesn’t matter much if only 1 of them (yours) is currently available for someone to acquire. I believe that the 2-inch proto is more valuable than the 2.5-inch actual production run at this time because no one is trading it on PinPics. But exactly how much more valuable it is in monetary terms, I cannot tell you because perceived current monetary value is way down the list of things I consider when trading. What Jabberwocky said regarding the demand for Proto‘s is absolutely true. However, I believe that a person who may not consider a different color finish desirable may find a different size to be rather desirable. In the above photo, the 2.5-inch actual production run pin is the 2nd from the left, and the 2-inch AP pin in the same color finish is on the far left. The other two 2-inch pins on the right are just the silver and gold AP versions. It was easy for me to locate the pin book those pins were in and photograph it. I am only including this picture in my reply to support my opinion that both sizes together are “spectacular”. With respect, these are some of my very favorite pins that I do not ever foresee wanting to part with. Disneychildwithin, TheMickeyMouseRules, watzshakinbacon and 2 others like this. Thanks much. Just sent it. Received and inserted into your post! Utterly gorgeous. But you know I share your love for the different color metal versions together! This is a very informative post. Thank you to all who have contributed your knowledge. Imp, I hope you get what you would like to out of your beautiful pin.